We really want to share our story, our journey with you. Now we can do this in a new dimension. We’ve thought about this for a while and got the chance to set it up. We cycle through many small towns and cities with their own story and often there is a postcard to be found. This postcard can be sent to you, just fill in the form on the left and make the 10$ payment. Yes, this payment is a bit more than the cost to buy and send the postcard, so you will also support us on our journey! We are travelling through some wonderful places and love to share our story with you. How it works: when payment is received and we can post the postcard we will either send one we have brought along the way or one from where we are and send it as soon as possible. Of course this is done by traditional postal service so expect that it will take a few weeks to arrive to your mailbox. On the postcard we will share where we are and what our feelings are. And we will even incorporate a personal drawing or doodle! 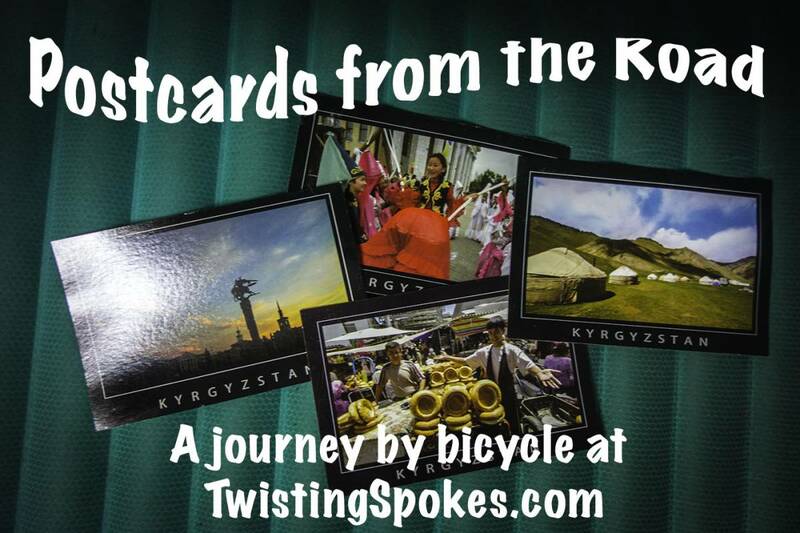 We will do our best to be timely on the posting of the postcards, please bare in mind that we might be cycling in a region with little internet. Below we have created a line of updates from every time we send one or more postcards from the road.